Literature suffers from appearing both deceptively easy and dauntingly difficult. We all like to think we can read a novel and understand what 'genre', 'style' and 'narrative' mean, but do we really understand them fully and how they can enrich our reading experience? How should we approach the works of great writers such as William Shakespeare, T.S. Eliot, Charles Dickens and Jane Austen? And what can we hope to learn from apparently difficult ideas such as 'hermeneutics', 'affective fallacy' and 'bricolage'? 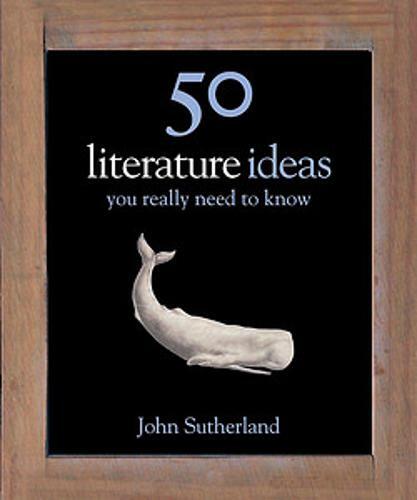 50 Literature Ideas you Really Need to Know is the essential guide to all the important forms, concepts, themes and movements in literature. It provides a clear, opinionated and thorough overview of theories about the nature of language and meaning, and outlines the thinking behind key literary concepts such as postmodernism, semiology, postcolonialism and structuralism. Best-selling author and critic John Sutherland offers a fresh and challenging overview of literary ideas and theories, from the apparently familiar to the decidedly unfamiliar. Packed with insights and examples from both classic and popular works, it is a book that will delight anyone who has ever been mystified by literary jargon and wants to gain a deeper, more thorough enjoyment of reading and writing.